This popular kit is basically a table that is 1200mm x 900mm (4ft x 3ft) in area. The tank stands beneath the table and nutrient is pumped up into the table at regular intervals. These irrigation cycles can be easily controlled by a simple electronic timer so that the irrigation is regular and reliable whether the grower is present or not. 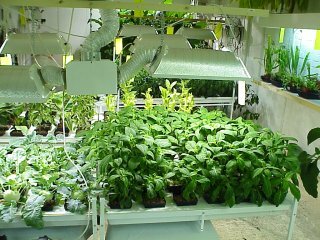 Flood & Drain technology is borrowed from commercial horticulture where it is widely used for production of flowers, herbs and salad crops. The so-called "hydroponic" application of Flood & Drain usually involves the use of expanded clay pebbles as a growing medium. The plants are simply potted up in the pebbles and placed upon the table. The pump forces the nutrient solution upwards - into the table, filling the tray and flooding the pots. The liquid keeps rising; forces the stale air out of the root zone and, for a while, immerses the entire root system in a bath of nutrient solution. When the timer switches off, the water returns to the tank, draining out of the table and drawing fresh, oxygen rich air down into the root zone. This is one of the most dynamic growing systems ever developed and it can deliver phenomenal growth rates and bountiful harvests. 1	FUTURE GARDEN Garden Tray 900mm.by 1200mm. 1	Submersible Pump 500 L/Hr.